What kind of hiking boot should I wear in the Bob Marshall Wilderness? Home ~ Uncategorized ~ What kind of hiking boot should I wear in the Bob Marshall Wilderness? Unfortunately and fortunately, there is not an easy answer to this question. It depends on your preferences and what peculiarities your feet have (all of our feet have ‘em. Could be you have sweaty feet, or long feet, or no arch etc. . . ) We recommend that you find a gear/shoe store that you trust and is good at fitting boots/shoes. 1. If you are going to be off-trail, wear a shoe with some ankle protection. I.E., not a low-top hiking shoe. 2. Wear a new pair of hiking boots for at least 2 months before coming on a trip. Wear them for several days in a row and on uneven terrain. 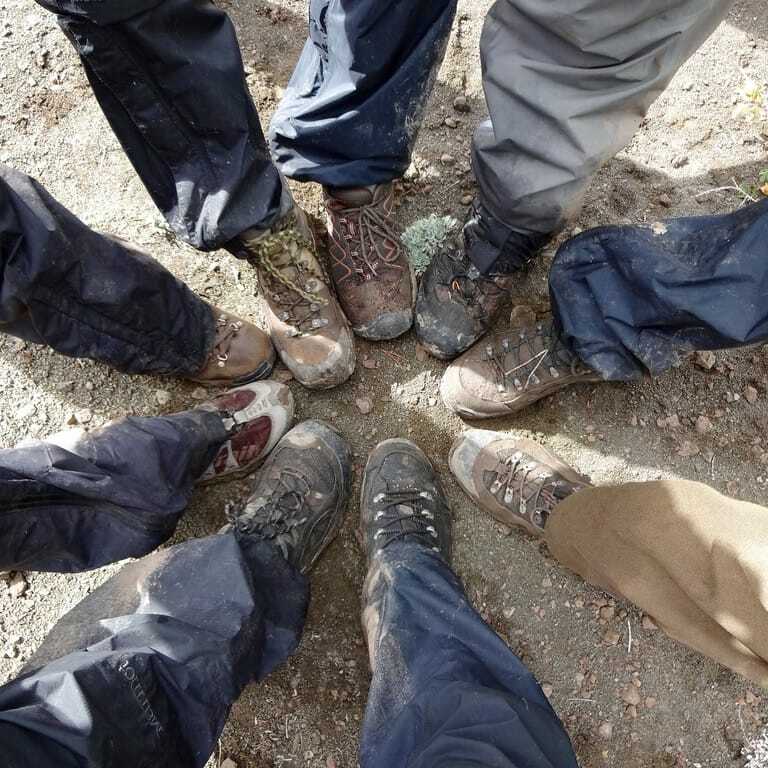 We often find that folks bring shoes that are broken in, but they still get blisters because they A) have not worn shoes several days in a row and/or B) they have not worn shoes on rough terrain to see where the rub spots in the boots are. 3. If the sole of your boot is starting to come off before the trip, do not bring your shoes on the trip. Sole repair during the trip takes a lot of time, limits your day hiking potential, and is only moderately successful. 4. Little hot spots are okay as long as they can be managed with the application of duct tape or Leukotape. 6. We highly recommend using in-soles like Superfeet or Sole. What is the best kind of hiking boot/shoe for you? – All-leather, high top boots (often with Gor-Tex). • Cons: Leather Gor-Tex boots can be very hot. For some folks, this causes additional blister problems. Also leather boots are generally more expensive, and can be heavier than synthetic boots. • Pros: Great ankle support, perform well on rocky terrain, if they have Gor-tex they keep feet drier in rainy/wet environments, less expensive then leather boots, generally lighter than leather boots. • Cons: Synthetic boots usually do not last as long as leather boots. If they are Gor-Tex lined, they can make feet hot, although usually not as hot as all-leather Gor-tex boots. • These have a combination of pros/cons of all-leather and all-sythetic boots, but they tend to be lighter than all-leather boots, but not as long lasting. • These tend to be synthetic or synthetic/leather mixes. If you do not need additional ankle support and don’t tend to roll your ankle easily, many folks like these because they are lighter and typically breathe better. These kinds of boots work well for on-trail hiking, but do not perform well off-trail where more durability and ankle support are needed. 1. Comfort – do they feel good and are there any rub spots you can feel from the get go? 3. What is your intended purpose for the shoe? On-trail hiking only? A mix of on and off-trail? Scrambling? 4. What kind of environment is the shoe going to be used in? I.E. wet, dry, cold, hot etc. . .
6. How long do you want shoe to last? We hope this helps you find the right shoe. Remember, you can always bring a shoe home and wear it around your house for a while to decide if they are right for you!